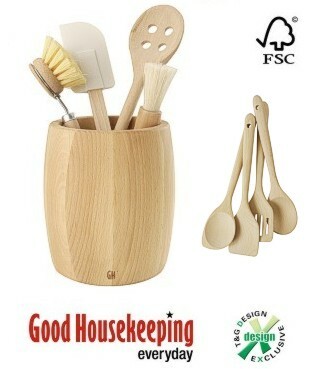 This high quality utensil pot is made from FSC oiled beech. Designed for constant use in the kitchen environment and to protect your utensils, the beechwood will give many years of trouble-free service. It is 15 by 13 cm in diameter (6 by 5 inches approx). All Good Housekeeping ® wood products are guaranteed for 3 years.